Enclosed bulletin boards can be used indoors or outside, depending on their materials. If you need a display for outdoor use, be sure your enclosed bulletin board has a vinyl-covered back and an aluminum frame. Outdoor enclosed bulletin boards resist the elements when mounted on a wall under an awning or overhang. You can use any materials – cork, wood, fabric etc. – indoors. Before you buy, check that your enclosed bulletin board is suitable for outdoor use, if that is what you need. Most enclosed bulletin boards have one of four back types – cork, fabric, vinyl or rubber. Cork is the most common back type and is great for displaying memos and certificates. Cork surfaces are self-healing, which means pin holes are not noticeable even after years of tacking. These surfaces are resilient, but not weather-resistant, so they should not be used outside. Vinyl backs are usually weather-resistant, so they are a good choice for indoor and outdoor use. Vinyl backs also come in many different colors, making it easy for you to find one that matches your school's décor. Fabric backs tend to cost a bit more, but have a more professional look. This type of enclosed bulletin board is perfect for lobbies or other places where the public will see them. Fabric backs are not weather-resistant. Rubber tack boards resist moisture and are a great option for outdoor use as well. Rubber boards are self-healing, resistant to stains and color fading. They're extremely durable, easy to clean and maintain, and will withstand years of abuse. Enclosed bulletin boards usually come with a wooden, aluminum or plastic frame. Aluminum frames are the best choice for outdoor use because they stand up to rain and other weather conditions without warping. If you are worried that an aluminum frame may look too industrial or harsh, try an enclosed bulletin board with a bronze, painted or satin aluminum frame. Wooden frames give your enclosed bulletin boards a classic look. Choose from many different finishes to match the decor in your hallway, library, or classroom. Plastic frames are your best bet if cost is an issue. These frames are affordable and easy to clean, but not as durable as aluminum or wood frames. Plastic frames can come in a variety of colors to match your classroom or work space decor. Some enclosed bulletin boards have swinging doors which make it very easy to access and change the materials inside. 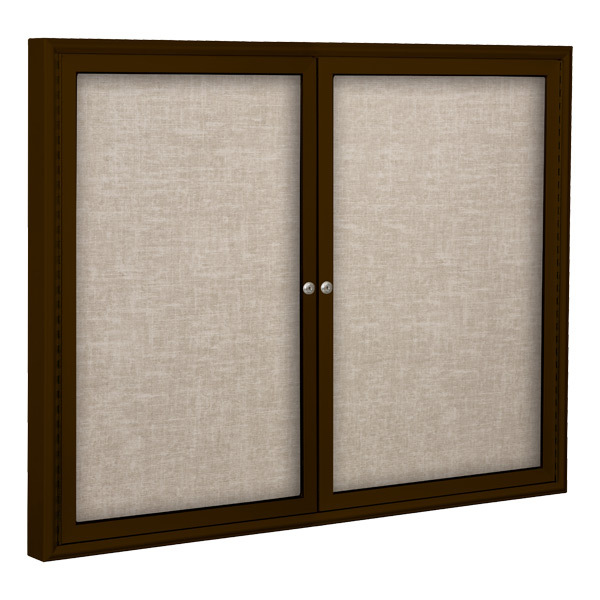 Others have sliding doors that are good for crowded spaces where swinging doors might get in the way. 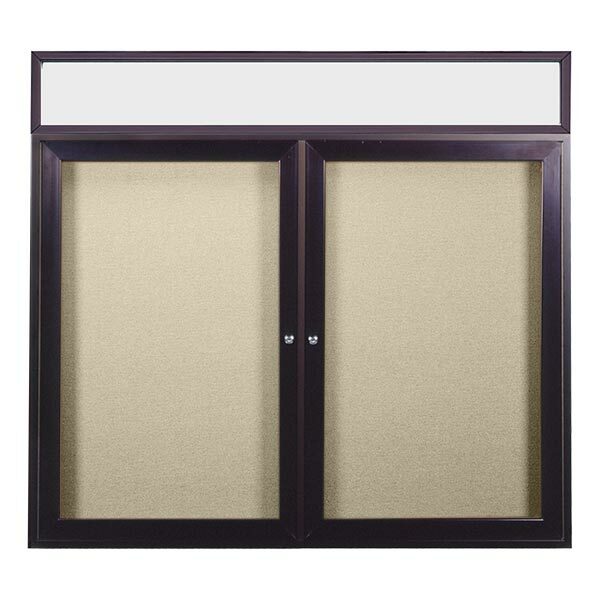 Choose one, two or even three doors per enclosed bulletin board. A header is a bar that fits above your enclosed bulletin board and includes customized information like your school name. Some enclosed bulletin boards come with a header; headers are also sold separately and can be added above an existing board. Headers can be lighted or unlighted. We have a great selection of enclosed bulletin boards. Click here to check them out and place an online order. If you'd like help figuring out which board is right for you or simply prefer to order by phone, call our friendly sales team at 1-800-260-2776.